We deliver with style and a smile. Office Express U.P. is located on the bottom floor of The Market Place, and can be accessed on East Lake Shore Drive under the City of Houghton parking deck. Office Express U.P. is a local business which can provide everything from paper clips to Post-it Notes and Toner Cartridges to a complete office suite. 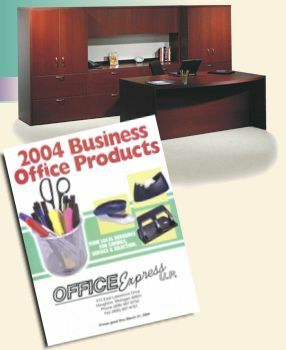 Our Catalog offers the largest selection of products in the industry --- more than 25,000 in all! And now, we carry gourmet coffees and teas at great prices! Don't waste your time shopping around for the best prices, we do that for you! And, we offer free shipping and delivery! Jack Ham, owner of Office Express U.P., also continues to offer great design, layout and installation of all your business needs: from home office, corporate office, schools of orthopedic seating. Your space will be organized, functional, comfortable and affordable! Adden Furniture "The Roomate Collection"
Systems furniture and seating designed to be the foundation, the building block, of your company’s evolving work environment. Ready to grow as your business grows. Ready to change when you are. Serviced by a company that’s ready to meet your ever-changing needs. 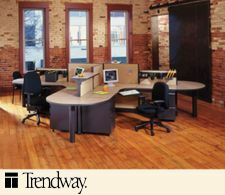 Trendway offers Choices and Contrada systems as well as the TrendWall moveable wall system. All products fully integrate and work with each other to accommodate any workplace need. And complete integration can vastly expand your office design options as well as minimize your investment. Integration of products -- central to our design and development -- means that Trendway systems furniture will change and grow along with your needs. 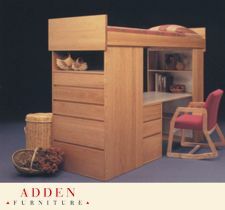 Adden Furniture serves the ever changing requirements of Educational, Military and Health Care professionals with high quality, low maintenance, easy to repair room furniture, tables, chairs, wood framed and fully upholstered lounge seating. Office Express U.P. carries the complete line of Woodlore Furniture. 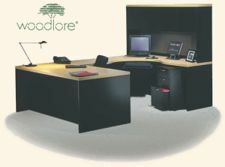 Woodlore offers a comprehensive selection of products designed to get your office up and running quickly, effectively, and with style. Our tradition of precision engineering and uncompromising quality, and our extensive offering of color and finish options, provide our customers with intelligent solutions designed to enhance their office environment. At Woodlore, we believe that furniture doesn’t need to be complicated. It needs to be versatile, affordable, and easy to install and own. It needs to be able to hold up to the on-going changes and reconfigurations common in today’s workplace. And it needs to reflect your style…simply and elegantly. Woodlore furniture does all that – and more. DuraCase and DuraFrame by Kwalu is helping its customers build value by providing solutions for real world seating problems which combine technology with style. DuraFrame is a one-of-a-kind patented technology made of a steel-reinforced polyurethane resulting in an impact-resistant polymer finish. This new product with "invisable" technology and structural durability is "virtually" indestructible. Kwalu offers a continually expanding selection including upholstered chairs, barstools, tables and settes in a wide range of styles, finishes and fabrics. DuraFrame saves you time and money, guarantees your satisfaction with a 10 year warranty on frame and finish. Kwalu is the ONLY manufacture to warrant the finishes on furniture. 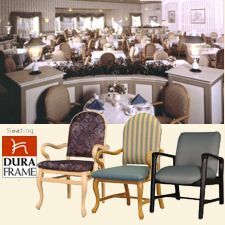 DuraFrame lasts twice as long as the furniture standard of 8 years with its patented Joint Construction and 1/8 inch thick high-impact polymer finish which makes DuraCase and DuraFrame both fire and scratch resistant. SitOnIt Seating is a customer-focused seating company. They offer the fastest delivery in the industry. Bar none! They manufacture up to 2,000 chairs a day, that's nearly 500,000 chairs a year! With Award-winning Customer Service and a lifetime warranty, your requests are handled quickly, no questions asked. SitOnIt's "Chair-in-a-box", means there are no tools required for assembly which makes it quick and easy to put their chairs to work in any environment. SitOnIt chairs are available in traditional and contemporary styles. Multiple standard options include ballistic nylon on backs, PVC arms, and Visco elastic memory foam. Call Office Express U.P. today so we can help you with your seating needs. We would be happy to bring you a SitOnIt chair to test out! Ask us about SitOnIt's newest "Transit" conference chair which offers outstanding function and distinctive style at a surprisingly affordable price! Call Office Express and SitOnIt today! 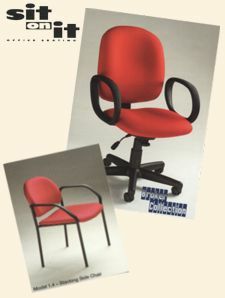 ISE is a manufacturer and distributor of high quality, leading edge ergonomic products for office and industry. 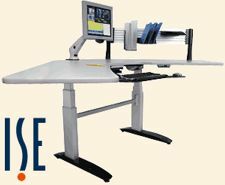 ISE offers an extensive line of ergonomic products to meet all of your needs. From computer accessories, space management, mobile furniture, keyboard combos to sit/stand systems, and so much more! ISE has successfully worked with a wide range of Fortune 1000 companies where health, safety, productivity, quality and well-being are driving today's proactive purchasing decisions. ISE is proud to be recognized by sales reps, dealers and customers as having the best customer support team in the business! ISE offers a limited lifetime warranty against manufacture's defects. ISE has a fantastic "Quick Ship" program in which your order will ship out and arrive within 5-7 days! ISE and Office Express U.P. can customize products to fit your needs. Call us today so we can assist you with setting up your work environment so it can work for you and not against you.